Look at the mixture of operating system environments visible through the one desktop shown below. 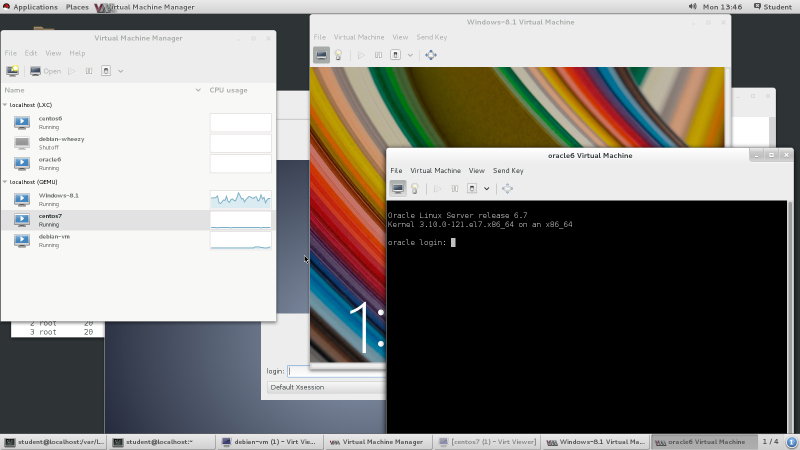 This is a Red Hat Enterprise Linux system running in graphical mode, with five virtualized systems running on top of it, both containers and full virtual machines. The most colorful one is a Windows 8.1 virtual machine. In front of that is an Oracle Linux container system in text mode, as appropriate for a server. There is a Debian graphical desktop toward the back. 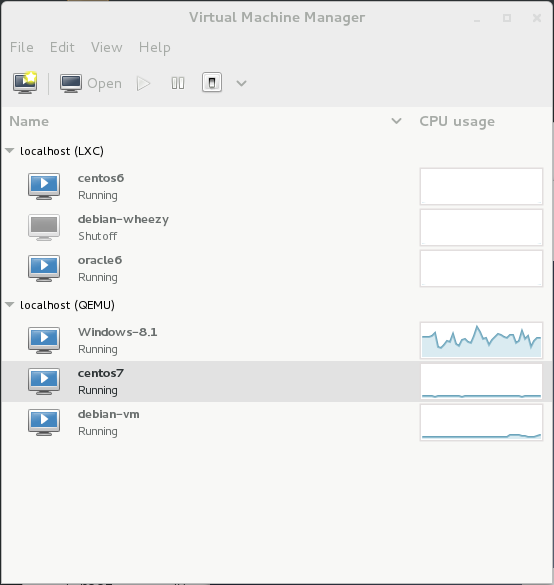 Also listed as runnning in the Virtual Machine Manager but without connections to their consoles at the moment are a CentOS 6 container and a CentOS 7 virtual machine. All this and more make up our goal. We want to control multiple operating systems running in multiple modes of operation, and do that through a common interface. We want to be able to do this across a data center, where the containers and virtual machines are spread across multiple physical platforms but we can easily control them all from one console. From the command line for efficiency and scalability through scripting, and from a graphical interface for easy visibility and insight. We need to get some terminology out of the way first. It can get a little confusing, but if we don't get it right we may end up doing the opposite of what we want. This is a one-page overview and review sheet for a 4-day course on Linux virtualization that I wrote for Learning Tree. Full virtualization has the hypervisor presenting virtual CPUs, memory, networking, and more, and the guest operating system is convinced that it is running on real hardware. The hypervisor must do dynamic binary translation to carry this off. It pretends to be the real hardware, ideally in real time but of course with some added latency. Paravirtualization is when the guest operating systems uses customized device drivers to access the virtualized hardware. The guest OS is not just aware that it is running on top of virtualization, it is using different drivers to run a little differently. See Linux systems running on Xen hypervisors, for example. Amazon Web Services' EC2 (or Elastic Compute Cloud) is Linux on Xen. The disk devices are not the usual /dev/sd* but instead /dev/xvd*, so named by the paravirtualization device driver for Xen-virtualized disk devices. EC2 is IaaS or Infrastructure-as-a-Service. Full virtualization can provide the greatest compartmentalization between virtual machines and between virtual machines and the host. That is, the greatest separation of file systems, process tables, and UID/GID identity or credentials. The hypervisor can even emulate different hardware — maybe the guest is Android on ARM while the host is Linux on x86_64. As you might already imagine, full virtualization, especially of foreign architectures, is slower. Hardware-assisted virtualization is an expanded CPU instruction set that lets the CPU do some of the virtualization work directly in hardware instead of the hypervisor processes in user space. Hardware-assisted virtualization has been around at least since IBM CP-40 systems in the 1960s, but the Intel/AMD x86 architecture only added this around 2005. Intel calls their version VT-x, AMD's is AMD-V. Look for the feature in /proc/cpuinfo, the kernel's notion of the CPU. You should find vmx on Intel CPUs and svm on AMD. You need it as virtualization is significantly slower without it. With hardware-assisted virtualization, performance can reach 95–99% of the bare-metal speed. Hybrid virtualization is when you have hardware-assisted virtualization supporting paravirtualization. Finally, operating system virtualization has become popular in Linux. There is a single kernel shared by the host and the guest systems, but some compartmentalization of processes, memory, and file system. Linux Containers (or LXC) are virtualization technology, while Docker is an efficient and scaleable management and deployment scheme for LXC. More recently, Docker added its own virtualization technology for improved performance. Chroot has been around for ages but only recently has it come to be widely considered as a form of virtualization. Linux Containers or LXC have their own UID/GID and process space, and Docker is a system for efficiently managing containers and sharing their design. KVM or Kernel-Based Virtual Machine is functionality provided by the kernel, and QEMU is the user-space mechanism for controlling KVM-based virtual machines. Both are used whether you're doing paravirtualization or full system virtualization, but QEMU is much more obviously involved in full virtualization, especially when emulating foreign architectures. Note that the above implies that /var/www/sbin/httpd exists, and it is either a statically linked binary or else /var/www/lib is populated with the needed shared libraries usually found in /lib. Furthermore, the web root will be beneath the new file system, so the web pages in /var/www/var/www/htdocs/*, log files in /var/www/var/www/log/*, and so on. And, very likely, /var/www/dev/ is partially populated with device notes, at least with null and random. That's on Debian, where /usr/bin/lxc-ls is a 15,958 byte Python script. On Red Hat it is from a package of the same name and version, lxc and 1.0.7, but it is a 2,837 byte POSIX shell script and the command lxc-ls --version yields a report on the version of ls! The following uses the shortest -n syntax, and uses name for the name of the specified container. Most commands have more options, the following shows enough to get you started. Provide information about the container. If it is stopped, the report simply reports that. If it is running, you see host-side information (PID of its init process, CPU and memory use) and container-side network information. Start and stop the container. The current terminal will be the container's console, you will see it start and then run its default program, maybe a login prompt. Use the -d option for daemon or detached mode. If you started the container with a detached console, using the -d option, this attaches the current terminal to the console. Start the namecontainer and execute command within it. Monitor the namecontainer, displaying one line per state change: STARTING, RUNNING, STOPPING, STOPPED. Configure the container to automatically start when the host boots, and disable this behavior. First, see the list of available container templates, mostly corresponding to distributions. Second, see the list of specific options available for the debian distribution. Third, create a container from that template, selecting the wheezy release option and naming it name. Create a new container new as a clone of existing original container orig. Destroy the container, deleting the container and all its data. Warning: This is very different from the destroy parameter to the virsh command, shown below! A container is defined by the configuration file /var/lib/lxc/name/config, which contains comments (from "#" to the end of the line) and simple feature = value assignments. Docker is a mechanism for managing and sharing containers. It uses UnionFS to very efficiently utilize storage. It was initially built on top of LXC, but it now defaults to using its own libcontainer operating system virtualization mechanism. The expectation is that Docker will be used to create lightweight containers dedicated to specialized single tasks, so it uses copy-on-write to very quickly create those new containers. A Docker image is a template from which a container may be constructed. A registry is a distribution point for images, analogous to an RPM or APT repository or repo. They can be public, shared with the Internet, or kept private within your organization. You can pull an image from a registry and run it on the local machine. If you make some improvements in that container, you can then push your new image to a registry so others can use it. Let's say that our organization has stored an image named centos, a container built from a basic CentOS installation. I could pull that to my system and make changes, adding the Apache web server and setting up some extra logging, and then push the result into our private registry. You could then pull down my image and add a database back end, and then push your result into the registry. Someone else in our organization could then pull down your image and run it. It seems like our registry must be growing quickly, with three images available — the original, the original plus my web server and logging, and that plus your data base work. But only the initial image will be a full image. My modifications, and your modifications to mine, are stored as just the changes needed to build the desired image. List the running Docker containers on this host. Add --all or -a to include those that aren't currently running. Show the history of name. Show the low-level details of name, which can be an image or a container. List the available Docker images in the repository. Start the needed Docker service. Start a container based on the centos image, using the -i (interactive) and -t (terminal) options to give me an interactive console terminal, and the --rm option to remove the container when its job, the Bash shell, terminates. Start a container based on the centos image, without an interactive console (no -i or -t), running the /usr/sbin/httpd web server, and mapping host TCP port 8080 to the container's port 80. A client can now connect to TCP port 8080 on the host and that tunnels through to TCP port 80 on the container. Create my own image mycentos from the centos container. Having made changes to mycentos, generate a new image webserver for future use. First, tag image webserver with the hostname and TCP port of our registry and the image's name. Then, push that image with that tag to the registry. You can also use a Dockerfile, analogous to a Makefile, to specify how to create a new image by modifying and starting an existing one. We could now build a container based on that Dockerfile. We will give it a fully qualified and meaningful repository, name, and tag with the -t option. In this example it's version (or tag) 1.0, named webserver in the project repository. QEMU is a generic open source machine emulator. It does full-system virtualization, where you run a separate kernel on the VM and that kernel sees a complete platform with your specialized number of CPUs, amount of RAM, disks, and Ethernet, USB, and audio interfaces. QEMU can emulate a different architecture. You can run a QEMU command on your Linux/x86_64 platform and have it emulate: an ARM system on which you run Android, or an UltraSPARC on which you run Solaris, or simply an x86_64 platform on which you run Windows. If you are on x86_64 hardware, starting a virtual machine with the virsh or virt-install commands described below actually starts a qemu-system-x86_64 process to emulate the virtual machine's platform. Specify which specific ARM variant and the amount of RAM. Pass the kernel and initial RAM disk image files. Specify the file containing the disk image, and indicate that it should appear to be on an SD memory card. Specify that the Android console is the first serial port, and that the serial port is (virtually) connected to your terminal. Carefully research the specifics, and be aware that the details vary not only from one architecture to another but also from one version of the QEMU tools to another. This page shows how one person got Fedora to run on a wide variety of architectures including AMD64, ARMel, ARMhf, i386, MIPS, PowerPC, and SPARC, and provides downloadable disk images in qcow2 format. libvirt is a toolkit for interacting with the virtualization capabilities of Linux. It includes command-line tools, a graphical user interface, and an application programming interface or API for C/C++, C#, Java, Perl, Python, PHP, Ruby, and OCaml so you can write your own command-line or graphical tools. libvirt can control a wide variety of virtualization technologies — KVM/QEMU, LXC, Xen, VirtualBox, OpenVZ, and more. In these URIs session generally refers to the user's access to the hypervisor and system to the system hypervisor. The virsh command is a do-it-all command-line interface to libvirt. Use -c URI to specify the hypervisor connection. As an example, the parameters list --all will list all virtual machines, running or not, known to the hypervisor. Containers run under the host kernel, "rebooting" or shutting them down only controls the processes running within the container. Disconnect the power supply. Notice the difference between this command, which abruptly turns off a virtual machine, and lxc-destroy, which deletes a container! virt-manager is a nice graphical tool in which you can monitor, control, and create virtualized systems. Use the File | Add Connection menu choice to add connections to other hypervisor schemes. In this view, lxc:/// and qemu:///system are in use. You could save that XML output in a file, edit the file to change the name string, remove the uuid and all mac address values, and then define a new virtual machine with with virsh define. There is a similar virsh net-dumpxml command, yielding the XML definition of a virtual network. The new net is there but the new virtual bridge is not. We must start the new net.